Rolls-Royce and Intel are jointly building intelligent shipping systems to make commercial shipping safer. Thanks to this collaboration, new ships will eventually possess systems that use the same technology found in smart cities, autonomous cars and drones. 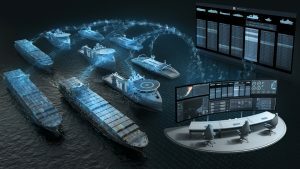 The next-gen shipping intelligence systems will have data center and artificial intelligence capabilities as well as sophisticated edge computing that independently manage navigation, obstacle detection and communications. According to the Intel/Rolls-Royce team, the components embedded in these systems are dedicated to workload consolidation, edge computing, communications and storage. Intel Field Programmable Gate Array (FPGA) technology will solve design challenges associated with shipping intelligence by providing engineers with a flexible platform and the IP and components for edge operations such as obstacle detection and navigation. Intel Xeon Scalable Processors optimized for High Performance Computing (HPC) technology will manage complex modelling of ship functions, with future developments using learning models to support fully autonomous operations. Memory and storage, including Intel Optane DC Persistent Memory and Intel Optane SSD Intel 3D NAND SSD will ensure ship intelligence systems are reliable, responsive and support extracting maximum value from the data generated through real-time analysis and systems modelling.